Celkem položek v této sekci: 71. We supply the stalls in the dimensions given by customer and these stalls are put either on an uniaxial or on a biaxial undercart. The stalls are offered either with its supplements or without (it depends on the customer). An adapter 220 V, a distribution into 4 female plugs, inner lighting for 12 V and 120 V, a selling window, a counter, an entering lockable doors accessible from a trailer´s drawbar, all these belong to the basic equipment of the trailer. 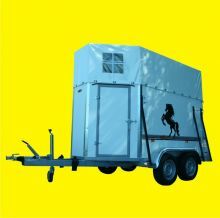 This trailer can be used as a mobile office (e.g for an exposition distributions ). In case of equipment demands the price depends on the kind of equipment and on the type of appliances. 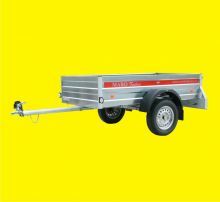 An undercart of the trailer is most reduced to achieve as good riding properties as is possible. Special axles with new improved springing warrant a perfectriding comfort. For even more improved springing it is possible to equip the axles with shock absorbers.Sideboards of the trailer are made of Finnish plywood of the highest quality. Floor of the trailer is made of special panels with an enhanced persistance, where 8 mm antiskid gum is stuck on. There is an extended quarantee for the floor- 48 months. Other components included in standing charge are following: a horses parting bar, adjustable constraints, stepney, Scotch blocks and automatically foldable supporting wheel. Trailers of RED EXPRESS model serie´s are of the highest quality construction designed for 3 motorcycles transport, four-wheeler transport, garden tractor transport, reaping machine transport, water scooter transport, bicycle transport, it is simply suitable for transport of anything needed for your comfortable recreation, company purpose or just for an ordinary living needs. 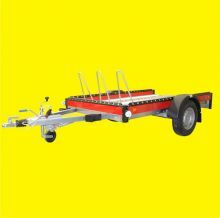 Floor of the trailer is made of pressed high-resistant galvanized sheet for better stability of transported motocycles. If you are not transporting motorcycles for that moment, front wheels stabilizer can be easily demounted. Trailers are equipped with the low aluminous lacquered sideboards with protective reling for its easy lashing purpose. There are 2 lightweight aluminous incursions placed under the loading area. We offer this trailer in an unbraked option of total weight of 750 kilos or those in a braked option of total weight of 750-1300 kilos. This auto transporter is of 3000-3500 kilos of total weight designed for two cars transport. Slides of the trailer are either aluminous or it is a perforated steel treated with a hot-dip galvanizing. The trailers are equipped with a revolving roller and either with a Schelgl (SRN) or an AL-KO (SRN) axles. Its frame is very fort so it will not creep even when heavy cars are loaded and transported. 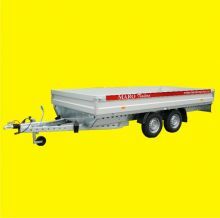 This trailer is of the precious driving properties even thought the trailer is quite long. 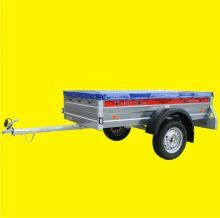 This is the cheapest trailer on the market of 2 metre length . Its loading area is 2060x1110x300. Design speed of it is 100 km per hour. Its quarantee period is 24 months and we offer it either without canvas or with the warping one. This is the cheapest trailer on the market. Price 8 402 CK + VAT. Its loading area is 1250x1110x300mm. Guarantee is 24 months. 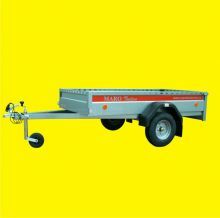 We offer the trailer either without canvas or with a warping one. These are the trailers of MARO Kralovice s.r.o. new modern serie. We managed to cohere its high utility value with its low price. Braking biaxial HELPERs are due to the usage of high-quality materials and its low price suitable for all logistic, constructional, garden and other companies usage. It serves as a very useful helper also for promoters and for other private daily life needs. 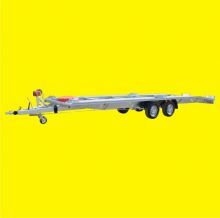 We offer the trailer either as a platform trailer or as an aluminous sideboards one. These alu sideboards are simply demountable, by this the platform trailer, useful for transport of either wider or longer things than the loading area is, is simply made. The trailer is also possible to be made in a design speed of 100 kilometres per hour. We offer also canvas design trailer with the height of the canvas construction 1800 or 2200 mm above its sideboards. At request it is possible to make an arbitrary construction height. All sheet metal unbraked trailers are having its sideboards made of high-quality zinc-coated steel. Skim sideboards have a good influence on their fort and endurance. Floor is made of an exterior foliated plywood with the non-slip retreatment. These trailers are shouldered with axles of Maro company trademark. Many superstructures and canvas of many sizes can be mounted on it. This is a warping canvas trailer without any construction under canvas.